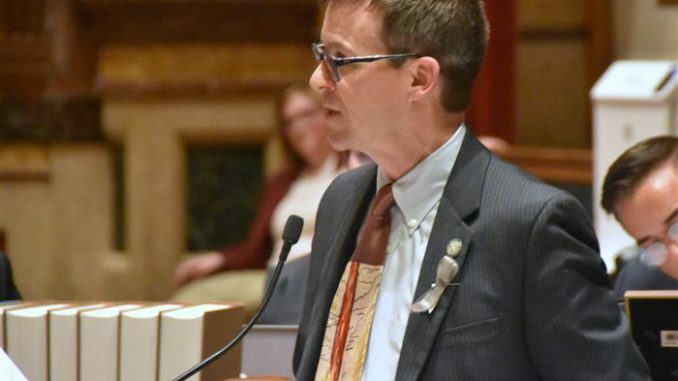 I spoke on the Senate floor against Senate File 213, the collective bargaining bill that limits the voices of public servants in their workplace. You can read some of my prepared comments at www.senate.iowa.gov/senator/bolkcom. This legislation will accelerate Iowa’s slide into a mediocre, low-wage economy and send more of our young people looking for opportunities elsewhere. This bill will put middle class Iowa families at risk. It will lower their incomes and health security. Senator Dix you told the Senate on the first day of the session that you were going to focus on Growth, Growth, Growth. Who knew it would be to grow the number of Iowans living paycheck to paycheck and on food stamps. Under the dishonest guise of local control your efforts will decimate the voices of teachers, nurses, fire fighters, police officers, jailers, snowplow drivers, mental health professionals and dozens of others. SF 213 makes it ILLEGAL for a school superintendent and a teacher organization to even discuss health care benefits, evaluations, grievances, seniority, and many other topics that help schools and workplaces operate smoothly. That’s right, ILLEGAL. It prohibits public employers from continuing to allow workers to voluntarily have some of their paycheck deducted for their union dues or for political purposes. Iowa’s collective bargaining law– a law that has worked to foster good worker-management relations across Iowa for the past 40 years. This bill will disrupt that balance and undermine morale and productivity at every public employee in the state. The bill will drive down wages and benefits for both union and non-union public employees. I want to share a few of the stories of my constituents about this legislation. I have talked to a parent, whose daughter is getting ready to graduate and begin her teaching career. She had her sights set on teaching in Iowa. Now her folks are actually encouraging her to look to other opportunities to teach outside of Iowa so that her financial and health security will not be in doubt. I have talked to graduate students who are represented by a labor agreement at the UI. One student is concerned the she will have to leave the university before she can finish her studies because she may not have the health care her family needs. I have heard from another prospective graduate student who will not consider coming to Iowa because of the uncertainty of wages and benefits going forward. This student had options to go to MN where the package is stable. This bill is an abandonment of rural Iowa. This bill is a gut punch to rural communities. I hear there is a lot of resentment toward public employees in rural Iowa. For some reason people resent teachers, and superintendents and people that protect us and work in our state prisons and state institutions. They make too much money and have good benefits. According to the USDA report: Rural Economy and Population: Employment and Education, Any decline in the number or quality of public sector jobs will have a disproportionate effect on Iowa’s rural communities because, as the USDA notes, the public sector is a “major source of earned income in rural areas” that tend to attract far fewer of the financial, professional, or information service activities concentrated in urban areas. Eroding the quality of public sector jobs in Iowa will further exacerbate recent effects of unprecedented declining public sector employment levels following the last recession, which USDA data suggests are already causing negative effects in rural counties, along with negative multiplier effects on private sector employment. These are the best jobs in rural Iowa. Or at least they were some of the best jobs. Who do you think local businesses are going to resent when they have fewer customers able to eat at their restaurants, shop at the hardware store and grocery store. Much less the local car dealer, local lawn equipment dealer and local gun store. Today, these public employees keep small town businesses in business. Get ready to shudder some more main street storefronts. Rural Iowa soon closed for business. Nice job. Iowans did not vote for this. Republican did not campaign for this. You campaigned on supporting the schools. You did not say you were going to attack teachers. You campaigned for safer communities. You did not say you were going to attack police, firefights and correctional officers. Republicans did not campaign on destroying the lives of people that work in local government, our schools or state government. But here we are with the republican secret agenda to kick in the doors of hardworking Iowans. Make no mistake. The next door that is going to be kicked in and the next target of this Republican majority is to destroy the pension security of Iowa retires and active public employees. If you are counting on IPERS for a secure retirement? Forget it. Your family is next on the Republican chopping block. Make NO Iowa retirees mistake. They are coming for you next year! Another major reason we should not pass this bill now and send it downstairs is that we have a lame duck Governor. How can we possibly let him sign this devastating bill? He is a lame duck. There is no accountability with the Governor. No accountability. We need to have the people decide. We need to have another election. The people need to speak. A new Governor should be in place before this bill is approved.